What is the audition for? What exactly is expected of you? Who are you auditioning for? What are you likely to be asked to do? What gear will you need to bring? Are you the right person for the gig? Find out the requirements, think about all the possible outcomes and then prepare accordingly. Auditions are not like job interviews but you’ll find there’s still a dress code for a lot of gigs you go for. If you’re auditioning for a rock band you’ll get some funny looks if you turn up in a suit. If you’re auditioning for a corporate/wedding band then putting on a shirt and demonstrating that you can present yourself well goes a long way. Your playing should obviously do the talking but that doesn’t mean your appearance isn’t important. Make it easy for someone to visualize you playing alongside them on stage. A few years back when I was doing the rounds and applying to different music schools each audition was different. When I went down to Drumtech in London there was a very structured audition schedule covering many different sides of your playing. I quite liked the format and did well. Then, when I did the Berklee audition, their CD player was broken, which meant I couldn’t play my prepared pieces and I was also asked to sing. As bad as my singing was, I still did well with everything else and received a good scholarship. Moral of the story, you never know what will come up, so be ready for anything. If you don’t get the gig, so what! There’s another right round the corner that might be a better fit for you anyway. There are so many factors that people base their decisions on in this business that you would be foolish to beat yourself about it. Be tough, take it on the chin and move onto the next one. Try to get some feedback from the people who auditioned you and make sure to improve in those areas. Your time will come. One of the first things to consider when learning to play the drums is the set-up of your kit. The height, angles and placement of your stool, drums and cymbals all effect the way you play so it’s a good idea to build the most ergonomically efficient kit for your body and style. This will give you the greatest control and touch on the kit – allowing you to play better, faster and for longer. Always remember, efficiency is more important than aesthetics! So many young players have their drums set up to look cool – but they find it difficult to play. What good is a piece of equipment if you can’t reach it or use it to it’s full potential? The first thing you need to get right is the throne so forget about everything else for the moment and place your throne in the center of an empty room with nothing around you. Now, sit down and check the height of your throne. You should feel balanced with your feet planted firmly on the floor. Your knee should form a 90 degree angle and you will have a strong base with your feet about shoulder width apart. Adjust the height until you reach the sweet spot. Look at where your feet are – this is where your pedals should be placed for the bass drum and hi-hat. Go get them now and put them in position. Now grab a pair of sticks and start to air drum. That’s right, air drum. With no drums in front of you, your body will find the most natural way to move and it will tell you were everything else should be positioned. Watch where your hands go, they will find the height and angle that is most comfortable. This is where to position the rest of the drums and cymbals. Now that your body has found where it is comfortable, start to position your snare drum. It should be in between your knees, easy to reach and easy to play. Play on it for a few minutes. Do your movements feel natural? Once your snare is where you want it to be bring in the toms. 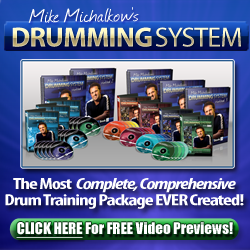 Keep air drumming to find the positions that are most intuitive and natural to you. Repeat this process for the cymbals as well. Now play on the kit and see how it feels to you. Close your eyes and see if your hands fall naturally onto the drums and cymbals. If they do, then you are done. If not, then continue playing around until you get to the position of greatest comfort. There will be times in your drumming life when you decide to add a new cymbal to your set up, take some toms away or bring in some percussion. Go through the same process to position your new gear in the best natural place. There’s not real mystery to it – it’s all about the feel. Don’t try to copy anyone else’s set up. Go with what works for you. Your body knows best and will tell you where everything should go. Keep air drumming and playing with your eyes closed to find what is right. When you play live or in a studio you might find that your ergonomically correct kit doesn’t leave much room for microphones. You’ll need to create a bit of leeway to get the mics in there so be flexible and accept the fact that it won’t always be the way you like it. The biggest challenge of all is when you start playing in different clubs and venues where the stage is tiny and there is barely enough room for your bass drum and stool. Again, you need to be flexible in these situations and go through the air drumming process for the space that you are presented with. You might not feel or play your best but you will still hopefully find a comfortable position. A great final test is to put the sticks down and play with your hands. If you can touch every piece on the set with your hands and play patterns without excess strain or effort then you know everything is where it should be. When it feels right, it is right! Another teacher that had a massive impact on me and my drumming is Joe Porcaro.